The exhibition Lumens & Currents comes out of several years of dialogue between the artists regarding their work and inquires into life. The artists’ works interact and form conversations around questions of luminosity, surface, materials, color and practices of close attention. 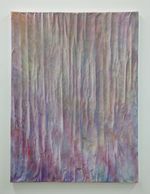 Elizabeth Chiles will be showing several new works made with a range of techniques and processes. 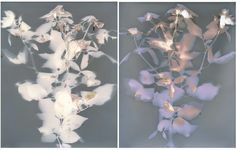 These include collaged photo-based works, a group of lumen prints in which the inner lives of plants seem to radiate from within, a large tapestry on semi-transparent fabric and a group of paintings made with fruit and flower pigments, whose photosynthetic nature will cause them to expose and shift throughout the course of the exhibition. 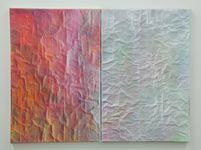 John Swanger will be showing paintings from a recent body of work, Current Paintings, which explore structure and spaciousness. 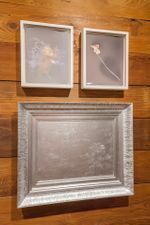 Related works give further insight into his sensibility and relationship to materials.In addition, he will be showing a selection of aluminum leaf works on reclaimed landscape and flower paintings. These works emphasize the topography of painting, the desire to reconstruct images and meanings, and speak to the mirrored aspects of looking. Elizabeth Chiles holds a BA in Art History from Columbia University and an MFA in photography from San Francisco Art Institute. She was a lecturer from 2009 – 2015 at the University of Texas at Austin, Texas State University and Southwestern University. 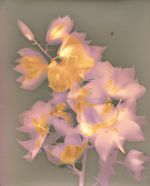 Her work was included in 15 to Watch at The Austin Museum of Art, in the Texas Biennial, and Talent in Texas, curated by Kerry Inman at Fotofest and Houston Center for Photography. 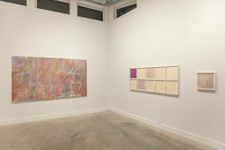 Her recent solo show at Pump Project was nominated for Best Solo Exhibition by the Austin Critics Table. She is a founding member of the collective Lakes Were Rivers, a group whose shows include, Strange Pilgrims at The Contemporary Austin, Contemporary Photographic Practice and the Archive at The Harry Ransom Center and Dark Matter at Vanderbilt University. Her project at Grayduck gallery is supported in part by the Cultural Arts Division of the City of Austin Economic Development Department. John Swanger (b. Lancaster, Pa.) graduated from Yale University, BA, Art. Gallery shows and representation have included, in New York, the John Weber Gallery, Galerie Lelong and the Gallery at Takashimaya. In Los Angeles, the Margo Leavin Gallery, Kiyo Higashi Gallery and Thomas Solomon's Garage. In Texas, exhibitions through Big Medium, the 2009 Texas Biennial and the 2016 Hunting Prize finalist exhibition. His work is in many collections, including, The Capital Group, The Progressive Corporation, Ritz-Carlton, Yale University and The Zen Center of Los Angeles. He lives and works in Austin, Texas.